Gov. John Hickenlooper on Wednesday signs a measure to reduce student testing in Colorado, as the lawmakers who worked on the bill watch, along with Griffin Kerr, the son of Sen. Andy Kerr, D-Lakewood. DENVER – Hailed as the most significant piece of legislation this year, Gov. John Hickenlooper on Wednesday signed a measure that reduces student testing. The issue has been surrounded by politics, with those from the left and the right meeting to demand reform that eases burdens placed on Colorado’s students and teachers. Those politics lasted to the very end, when Jefferson County Public Schools last week blocked Hickenlooper from signing the legislation at Lakewood High. 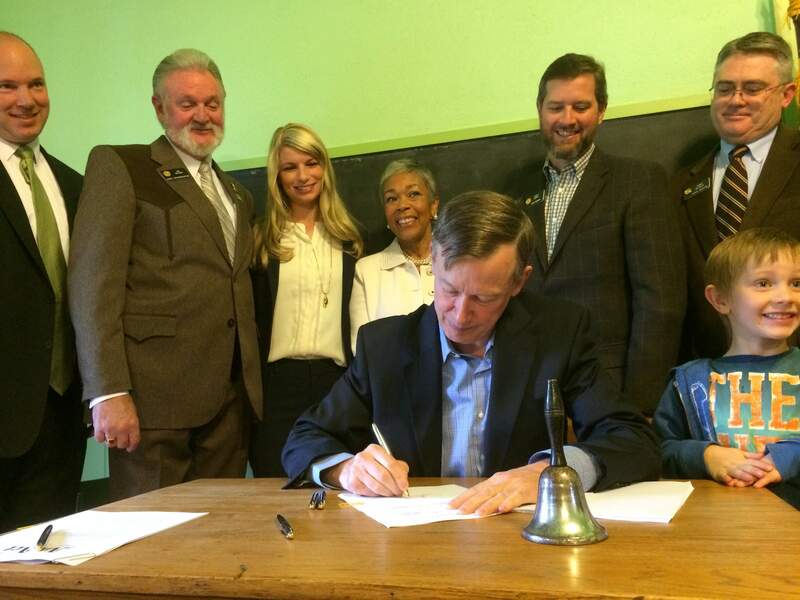 The governor ultimately signed the bill at a historic schoolhouse at the Lakewood Heritage Center. “I fear that it’s a reflection that education has become more polarized and more partisan, and that’s why what we’re doing here today is so important,” Hickenlooper said. Lawmakers advanced a bill that reduces about 40 hours of testing, but it doesn’t go as far as eliminating ninth-grade assessments, which had been a sticking point during the debate. The law eliminates Partnership for Assessment of Readiness for College and Careers, or PARCC, tests in 11th and 12th grades, replaces 10th grade PARCC exams with a trimmed college-preparatory test and creates a pilot program enabling local districts to create alternative tests, which could theoretically replace current PARCC tests. Another bill signed by Hickenlooper reduces the frequency of social-studies testing. Still required in Colorado are language arts and math testing in third through ninth grades, as well as science tests in each school level, including elementary, middle and high school. The college-readiness ACT exam will still be given in 11th grade. Many of the requirements mirror recommendations by a task force earlier this year that met to discuss the testing issue. Durango School District 9-R Superintendent Dan Snowberger chaired the committee. The effort nearly derailed several times, with about a dozen other testing bills dying throughout the process.